Driving in this morning we realized that small cars were suddenly looking sweet. 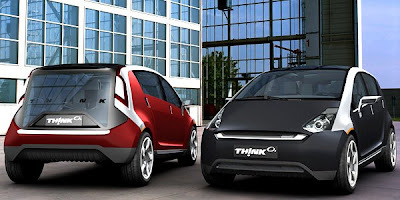 Take The Ox, a concept design by Norwegian car maker Think. The size of a Toyota Prius, this baby is pure electric, goes 0 to 60 in 8.5 seconds, and can run more than 120 miles on a single charge. The car is slated for release in two years for about $25k. Which is curious. Why do we respond to this design and suddenly crave smaller curves of sheet metal? Does our subconscious realize that resources are scarce? Perhaps it’s the vibe we get before a hot summer, when everyone wants to disrobe, go on a diet, and work on the six-pack … because heavy consumption in times of heat just doesn’t feel right. We bet this type of efficient design will embed itself in other products, as the combined weights of recession, high energy costs, environmental guilt and consumer conversion to a very visible product — small cars you see every morning — make little the new big. Designers, time to go on a diet. totally impractical cars like the Think, which cannot reach destinations even as close as 60 miles and still make it home. The company and its shills are also spreading the misleading claim that the car can be recharged to 80% in 10 minutes. The actual time is more like an hour and if you think your house has a circuit strong enough to put that much electricity into a car that fast, then you obviously don’t know much about electricity. A lot of those pimping EVs don’t know a kilowatt from a kilowatthour. I appreciate your thoughtful response, although “pimping” and “shilling” are a bit bad form. I agree that electric vehicles are not a panacea (much of the energy for electricity comes from coal in the U.S., for example) but I do stand by the idea that efficient *design* will change … cars will get smaller, and people’s perceptions are shifting as a result. If I sound like I’m promoting this car, it’s because I love the efficiency of its design … and as you rightly note, under the hood the design is more problematic. The big picture is that despite EVs’ flaws, and the sordid carbon-footprint math that goes behind the energy of any vehicle, it is wonderful that the world is exploring options to find better transport with less pollution and less cost. We won’t get perfection tomorrow, but at least we are beginning the new journey.